That tells you what the mouse can do. OK, so let's make a truncated pyramid, also known as a podium. Well, actually Ulrich might have had it slightly wrong. He was making an anti-podium, so let's do that (lateral faces are triangles rather than quads). 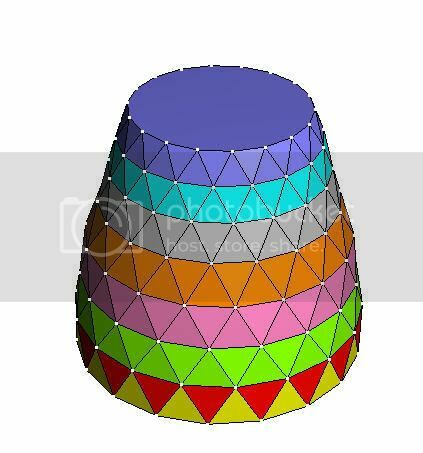 First, the resulting solid will not have dihedral symmetry, so from the drop-down list that initially says "8-fold Dihedral" select "8-fold Pyramidal". Let's start with the big base octagon. Just hold down Shift and Left-click on each vertex in turn around the base (actually after doing three you can hit the "..." button to auto-finish the polygon). Then hit Enter to accept this polygon as complete. Do same again for the top octagon, using vertices closer to the centre. And here it is after accepting (it's repeated over the symmetry group, so 8 triangles are created). If you really did want a podium rather than an anti-podium, then you would start with an octagonal prism instead of antiprism, and create lateral quads. So while holding down Ctrl, hold down the right mouse button and drag the mouse left and right. You will see the width of the top of the antiprism get bigger or smaller. Also try the left mouse button and drag to change the height. Hit Enter when you're happy and with to keep the result. You can then select the new top face and repeat the process to add more layers. Should be quite fast and easy, and the augmentation options box will remember your settings from last time, so you don't even need to keep selecting the Antiprism option. I have been messing about alll afternoon and have built (and saved) the above. With a little more work on this method I am quite sure I will be able to achieve what I need. As you will see, from the above, I have made quite a bit of progress today using your 'alternative' method of construction. 2 .... After about six augmentations the software seems overloaded and some quite odd things start to happen happen. Can this be ovecome or should I start a new drawing for the next six or seven floors. Anyway, I must thank you for your great assistance. If anybody else wishes to construct a similar model, from wood, I would be only too pleased to share with them my methods of working. Just select a face first using Shift+Left-click, or double-click on a face. Make sure you're in the default mode first, not faceting mode or anything (hit Esc to return to normal mode). Currently creation of nets is usually done via the stellation process, which becomes expensive for models with lots of faces. So make sure no net or stellation views are open while building the model. Then Stella should handle it easily. There's a trick at the end to allow Stella to create the nets more easily once you've finished too. 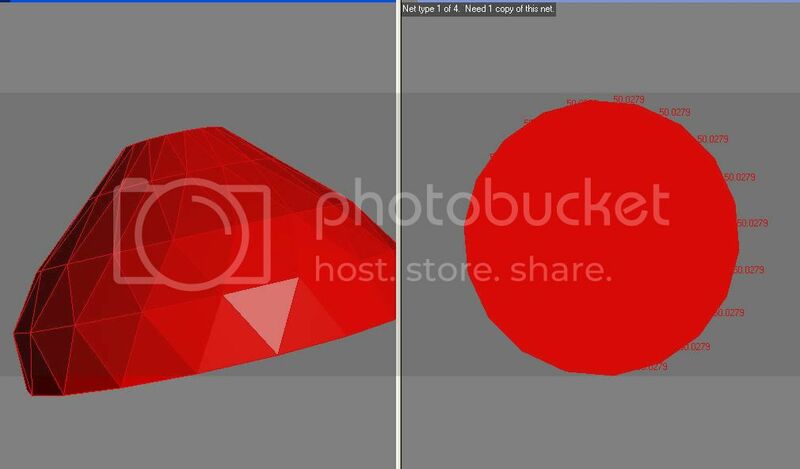 Use "Poly->Create Convex Hull". Provided your model is convex, nothing should appear to change, but now Stella knows the model is convex, and can create nets without going via stellation (and thus much faster). Actually, if it's more than just going slow (and potentially slowing down the whole computer), maybe you can expand on what you mean by "odd things". 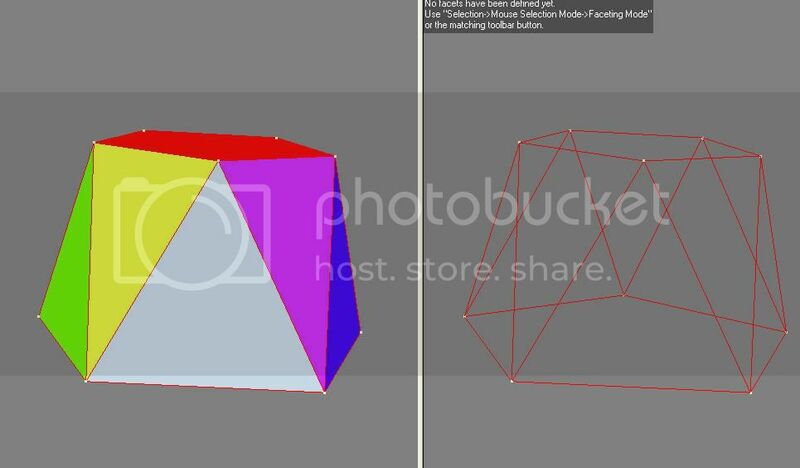 I have attempted to build as you suggested (using 'convex hull) but I am still experiencing some problems. After seven augmentations the programme/computer faults with a message like .... 'Shape not accurate enough'. I can overcome this practically by proceeding just one layer at a time... I only need the mitre angles and side lengths .... but it would be nice to see the whole gherkin shape as one model. I am posting two shots of the shape that I am currently working on. Hmm, I just tried with more than 7 layers and it didn't complain. Sometimes accumulation of errors can be a problem, but mostly only when stellation is involved (which is often the case when creating nets). If you get a message saying "Warning: this model may be too complex to stellate" then you're already doing something wrong, as it should be possible to avoid stellation altogether. You really need to find the precise measurements of that building. Surely they're available somewhere. This method isn't well-suited to recreating it though, since the sizing must be done by eye. I am happy with the shape, so far, but cannot seem to be able to augment any further. If I sent you a copy of the file could you possibly show me how to add a further three layers to each end of the current shape. 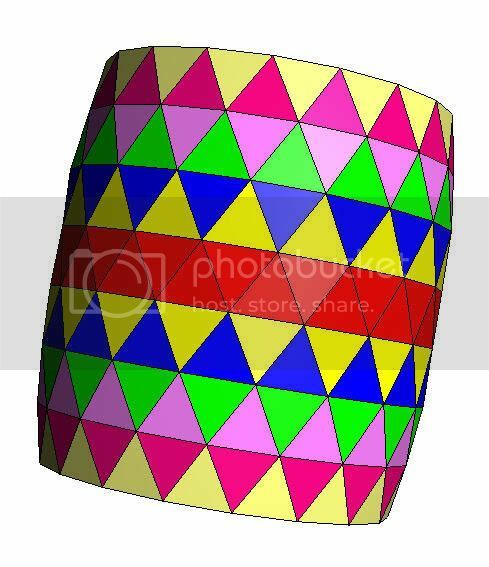 the green mauve bright pink and pale yellow are angled inwards slightly and I would wish the three layers, added to each end of the current shape, to be angled, by eye, a similar ammount. Sure, send the .stel file to me and I'll see what I can do. 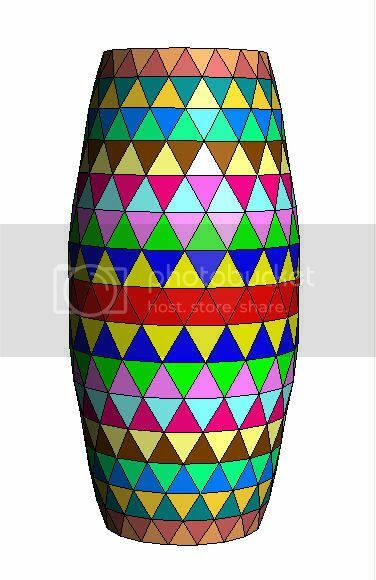 I will be using this shape as the base for my model. From the 'nets' I can extract all the triangle details (length of sides and mitre angles). Without your programme I very, very much doubt that I could even attempt to construct this rather complex model. The top layers including the 'lens' will be done later as a separate file. Would it be of any interest to post, from time to time, photographs of stages showing its construction? Squeaky wrote: Would it be of any interest to post, from time to time, photographs of stages showing its construction? Sure. You should probably do that in the Polyhedron Models forum. Can I put the augmentation that produced say layer 16 (from the London Gherkin) into memory? Then, using this layer as my staring point, build up the remaining layers to produce the top part of the model. Or...... Will I need to start from scratch with an antiprism with the sizes found from the nets of the base part of my model? Then ignore the base layer, when actually building the model .... because it will be straight sided? Squeaky wrote: Can I put the augmentation that produced say layer 16 (from the London Gherkin) into memory? You could use faceting mode to create the faces you need for just that part. 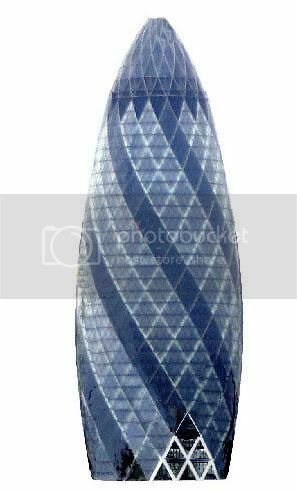 I've decided that for my next modular origami project I'd like to attempt to construct a model of the London "gherkin" and was delighted to find this model had already been discussed on this forum back in 2008. Like Squeaky, my main use of Great Stella will be to create an approximation of the Gherkin, in turn giving me the dimensional data I need for modelling. Rather than start from scratch in Stella, I wondered if you still had the .stel file you worked on with Squeaky back in 2008? I messaged Squeaky with a similar request a month or so ago, but haven't had a response and it appears that he is no longer an active member of this forum. Given that it was 7 years ago, finding one .stel file amongst many is probably a big ask, but if you can help that would be great. If not the previous posts on the topic appear to give me an excellent starting point. OK dabeard, didn't take me long to find again. I just emailed it to you.